Learn the techniques mixed martial arts fighter use in the ring! For both children and adults! 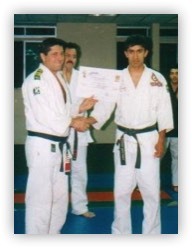 Master Patricio Saavedra our head instructor cares about all of his students. Learning proper technique under from careful instruction is most important. 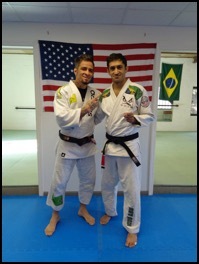 Our BJJ Brazilian Jiu-Jitsu (BJJ) is focused on grappling and ground fighting and fits nicely with our traditional karate program. 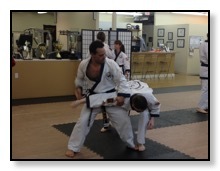 It focuses on the principles of leverage and proper technique to obtain dominant control over an opponent. BJJ has been proven, when used properly, to be an effective method for dealing with bigger and stronger opponents and has become increasingly popular due in part to its great success in Mixed Martial Arts (MMA). By learning how to defend yourself against even larger opponents you gain greater confidence in yourself. This carries over to other areas of your life whether on not you are young or an adult. We always say that, "we teach our students to take what they learn on the mat and apply it to their every day lives!" Master Saavedra will teach you how to effectively use the techniques you learn and apply them in actual self defense scenarios. 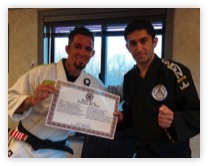 The program consists of techniques that were learned in the Gracie Jiu-Jitsu system by Master Saavedra. 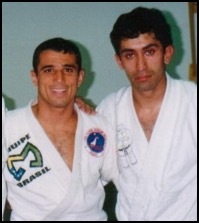 Master Saavedra is one of only a few instructors who learned the Gracie system in Brazil! Because of both the aerobic and anaerobic components to BJJ your cardiovascular health and strength can improve. You'll build muscle, breathe better, sleep better, and have energy throughout the day! Although Brazilian Jiu-Jitsu is an art that allows smaller practitioners to win against larger, stronger opponents, sometimes things do not always come easy. In these situations, we learn to address our short comings and improve our ability to handle difficult situations. This process develops our character, our patience and our humility.